On the same day the 2020 Ford Super Duty was officially revealed, the all-new 2020 Chevrolet Silverado HD was released as well. Both behemoths are bestowing themselves at the 2019 Chicago Auto Show. Chevy’s new truck is massively improved from before, and will come with a 35,500 pound towing capacity. According to General Motors, the 2020 Silverado HD has been upgraded to enable a 52-percent increase in max towing capability, resulting in 35,500 pounds of pull for regular cab, two-wheel drive, dual rear-wheel, diesel models. Why is this number significant for Ford fans? Well, because it’s 500 pounds greater than the current Super Duty. Our sister site, GM Authority reported about the new Silverado HD and its staggering towing stats before it was revealed at the Chicago Auto Show. Now that we have heard the news, we have to discuss what this means for Ford. It’s only a difference of 500 pounds, but in the truck world that’s a big deal. Trucks are a bit of a measuring contest, so when one automakers truck can out-tow another, well, it sparks a debate about who is best. 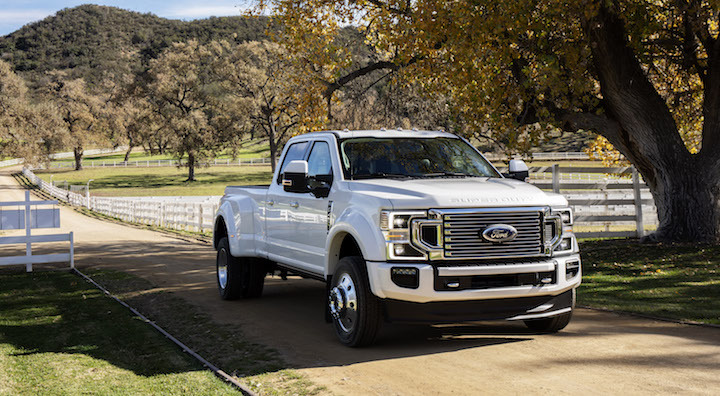 Officially, Ford boasted their best-in-class 35,000 pound gooseneck towing capacity with the 2019 Super Duty, but that ‘best-in-class’ designation can no longer be used. But, fear not. Chevy may hold the crown at the moment, but the figures still haven’t been released regarding the refreshed 2020 Ford Super Duty. And the game of leapfrog must continue. The 2020 Ford Super Duty will come with some exterior updates, two new engines, and a 10-speed automatic transmission. And that’s just what we know about at the moment. Stay tuned to Ford Authority for more Ford F-Series Super Duty news. 2020 Silverado is not for sale yet! Therefore, Ford still has bragging rights for what is on sales.